A form of companion planting known as the “Three Sisters” is taking off in the Franklin Permaculture Garden. Three Sisters is a type of polyculture farming originally practiced by many Native American societies in traditional organic farming. Polycultures involve creating a diverse natural ecosystem by combining different beneficial crops as companions for one another. This encourages an increase in biodiversity among species and offers unique benefits such as pest-control, improved soil quality, and a greater aggregate yield. Three Sisters agriculture reflects this highly functional polyculture system that we’ve come to embrace at UMass. Polycultures are often applied to more functional spaces like the Franklin Permaculture Garden. This is because the intention is to have a diverse environment of plants co-existing as opposed to simply one crop, something we embrace in permaculture. We see this reflected by the Three Sister crops, which include corn (maize), climbing beans, and squash. Each vegetable contributes something to its sisters that is uniquely beneficial. CORN: Corn acts as the centerpiece of the three sisters, and forms the structure that the other sisters rely on. Corn grows in the middle and acts as a stake that the beans, which grow vertically like a vine, use to climb on. This gives us a vertical yield and allows for a more functional yield in a smaller space. We can plant more beans and squash if they stay close to the corns stalk. So we receive a greater aggregate yield of all three, (as opposed to massive amounts of just one in a monoculture). BEANS: While the corn gets tall, the beans (a type of legume) use their unique root systems to benefit their two sisters. Beans have roots that contain nodules packed with nitrogen rich bacteria. Making use of this bacteria the process known as “nitrogen fixation” can then occur in the soil and convert this nitrogen into ammonia which all of these crops use to grow and compete with other plants. Since corn lacks two important amino acids, lysine and tryptophan, the beans provide these for the human body to make proteins. A perfect balance of nutrients between corn and beans. SQUASH: Squash is also a vine-like plant that spreads its leaves out lower on the ground. With these huge leaves that cover much of the ground the squash blocks sunlight from allowing weeds to grow, and its prickly vines deter pests. In addition to these benefits its leaves create a microclimate that helps retain moisture in the soil. Squash (Front) we place planks over our trenches to prevent the large leaves from getting too wet and rotting, after a heavy rainfall. Instead of growing these crops separately as one mega-crop in a monoculture, we implement the Three Sisters for all of these beneficial reasons. We also do it for a greater aggregate yield. In a monoculture that contains just corn alone, if the corn becomes diseased, you lose all your corn. 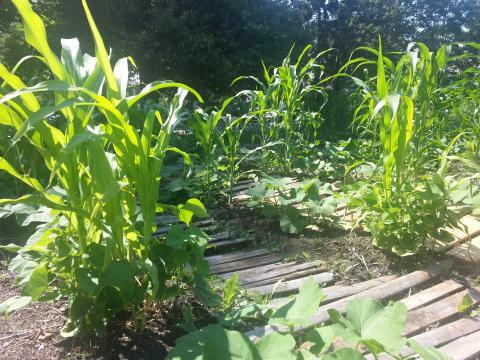 In a polyculture, if the corn fails, you still have beans and squash. This is related to a permaculture principle known as the “Principle of Redundancy”, which means meeting every need in more than one way, so that if one method fails we have a backup. Even with embracing this principle keep in mind the likelihood of the corn failing at all in a polyculture is greatly reduced with the increased soil health and added benefits of pest-control and moisture retention. The Three Sisters are a complete win-win-win! Permaculture and polyculture are two peas of the same pod. It’s a farming technique that respects the plants and soil for all of unique benefits they have to offer. The Native Americans definitely got this one right. Polyculture promotes diversity and plenty of food for a community.